This fish is often kept in smaller tanks that do not allow for the full size of a mature specimen. Add rocks or artificial caves to provide hiding places and use subdued lighting. Although this fish will accept anything offered, its diet should be mainly vegetable based. Spirulina flake or pellets along with algae wafers are ideal for the staple diet. Treats of blood worms and brine shrimp will also be accepted. As this is a mostly nocturnal fish, an evening feed should be of more benefit. As of yet, there are no reported cases of this fish breeding in the aquarium. In the wild they use holes in the river banks for spawning sites. 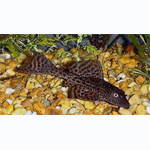 Keep with medium to large sized community fishes or most American cichlids.